Listed on the National Register of Historic Places, the McCloud Hotel provides a unique step back in time. 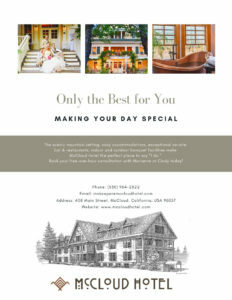 From our warm inviting lobby and lush gardens to the intimate dining rooms at our restaurants or the grand banquet room, the historic buildings and grounds that makes up the McCloud Hotel provides craftsmanship and details largely preserved in its original condition from the turn of the century. With venue space to accommodate 20 to 200, the McCloud Hotel is the perfect venue for gatherings large and small. Full-property buy-outs are available for those looking to host larger groups. The hotel’s patio and garden space boasts two seasonal fire pit, pergola covered terrace and garden nooks. From the moment you and your group step in the front door and up to the registration desk, you’ll know that our Mt. 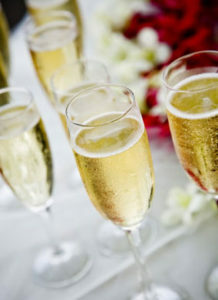 Shasta venue has seen to every detail to make your gathering a success. From intimate garden weddings to elaborate ceremonies and receptions, we are here to assist in every detail of planning your event or special occasion. 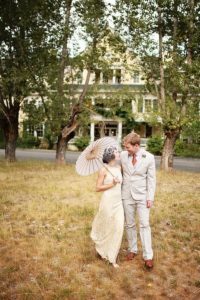 From a garden ceremony to a full, sit down dinner reception in the Cascade Room Event Hall, the McCloud Hotel offers a memorable Mt Shasta wedding venue for this most special of occasions. Indoor and outdoor venue space for up to 200. All weddings require that you book all rooms in the hotel (for one night off season and two nights between May and October). What could be more romantic than a proposal with a waterfall as the backdrop? 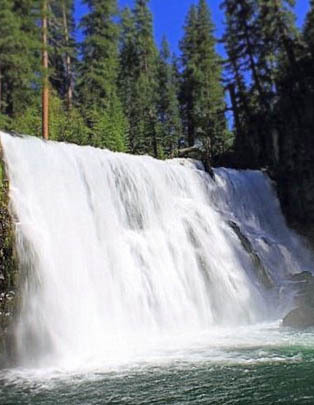 The McCloud River Falls are just a five mile drive from the McCloud Hotel and we can provide a picnic lunch for Hotel guests. Also, our Garden has several secluded nooks that are perfect as places to pop the question. Planning a company retreat or meeting? Our high speed fiber-optic WiFi makes work and play easy at the McCloud Hotel & Hall. How about meeting up in McCloud for your next family reunion? We’re half-way between Portland and San Francisco, Seattle and Los Angeles, Reno and the west coast. 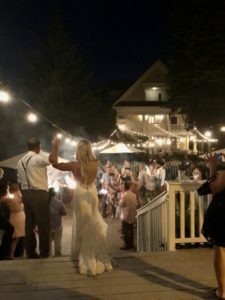 Whether you’re planning a wedding, vow renewal, rehearsal dinner, birthday party, family reunion, conference, retreat, or something else, we can accommodate groups big and small. We may be only a few hours away from the city, but we’re a world away in mind-set; providing the perfect backdrop in any season for renewal, relaxation or commitment. The McCloud Hotel provides full service catering too and several menu options for all budgets. Our catering menus reflect an organic focus and a curated beverage list provides local craft beer, distilleries and wine. Considering a destination wedding or event? We know how challenging it is to see to details from a distance. The McCloud Hotel staff will be happy to assist with the arrangements and help you coordinate with vendors. 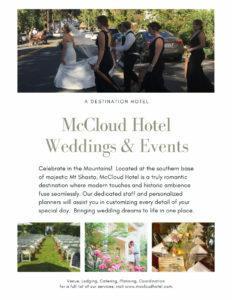 Email innkeeper@mccloudhotel.com for a wedding packet. Call 530-964-2822 to arrange a tour.